Description: New front Flip Sight Tower / gas block YHM-9394. This front sight is all steel construction for superior strength in demanding conditions. The flip sight is easily concealed with the push of a button and locks in the deployed position. This sight accepts all standard AR sight posts and hardware (Included). With this setup you get the convenience of a flip front sight with the same weight as a standard AR sight tower. 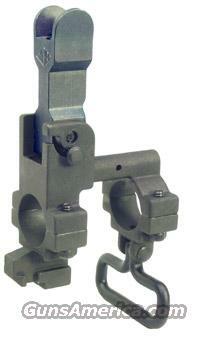 This sight’s two-piece design allows it to be mounted on firearms with pinned and welded muzzle accessories. More photos on request. It mounts easily and securely with four cap screws. I accept all credit cards, also cash, personal checks, company checks, money orders, cashier's checks, and bank checks. No credit card fee. Stock photos. $3 shipping. Florida residents add 7% tax. I sell a variety of AR15 products and combine shipping. Rich.